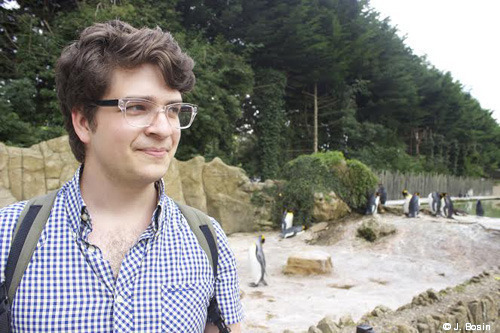 The newest member of the Artisans of Leisure team is Luke Pyenson. Read on and you’ll see why! Q: What got you started traveling? My whole family loves to travel, in particular my grandmother, who has been all over the world. Growing up, I would hear stories from her or my parents about various far-flung places, and I used to love leafing through old travel magazines when I was young. As my interests came into focus, travel was unsurprisingly at the forefront. I was an avid player of Where in the World is Carmen Sandiego, a travel-related computer game. And I used to watch these travel VHS tapes for kids hosted by an anthropomorphic globe with an Australian accent. Gradually, he was replaced by Anthony Bourdain. I’m fluent in French, Spanish, Italian and Arabic (Classical, Moroccan and some Levantine), and conversational in basic Mandarin. I can get by in German and Portuguese. Q: Why did you decide to learn these languages? I started with French in middle school because I was interested in the culture. While interning in restaurant kitchens in my teens, I learned Spanish from the Central American and Mexican cooks because I wanted to connect with them and learn about where they were from. I started studying Mandarin in middle school as an extra class because I wanted to start learning a non-Western language. In college, I took a semester of Italian and four years of intense Arabic, which formed a large part of my major. I was motivated to study Arabic because I’m deeply interested in Arab art and cuisine. Q: Tell us about your interest in food. I was raised in a family that really values eating well, and my mother is a food writer and cookbook author, so an interest (some would say passion) in food came naturally to me. I have been contributing food articles and recipes to a variety of publications for several years and am more or less always thinking about food in some respect. Food is of course a great window into other cultures, and eating and cooking are as much intellectual pursuits for me as they are visceral. Italy. 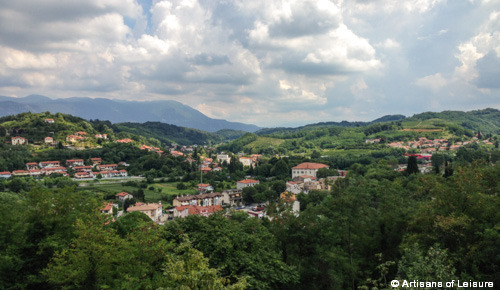 And if I had to single out a region, Piedmont. The cuisine there is so special, and each time I go back I discover some new regional dish or preparation I’d never heard of. My favorite time to go is late summer, when hazelnuts and blackberries are in season. I also love Liguria for fresh seafood and, of course, pesto. But it’s very, very difficult to go wrong anywhere in Italy, and every region has something—even just a particular pasta shape—worth trying. Mexico is difficult to beat, too. Mexico City has a great restaurant scene, and of course there are many treasures to be found in the taquerias and torta stands around the city. Oaxaca has a very complex and distinct cuisine, and is an essential stop for anyone going to Mexico who loves to eat and/or wants to try seven types of mole. And, as surprising as this may sound: London. When London was bereft of good food, I hadn’t been born yet, so the London I know is full of great things to eat. I sincerely believe it’s a little easier to find a great meal in London than it is in Paris, and much less intimidating. British cooking has undergone a serious renaissance recently, and there are so many fantastic ingredients circulating around British kitchens. When I was 14, I went to France for the first time with my parents. We set aside one afternoon in Paris for lunch at Le Pre Catelan, an absolutely beautiful restaurant in the Bois de Boulogne. At the time it had two Michelin stars, and now it has three. This was likely the first time I was introduced to the concept of Michelin stars at all. Never in my life had I tasted flavors like what I tasted during that meal, including the chocolate tart I had for dessert. It was a level of chocolate I didn’t know existed. 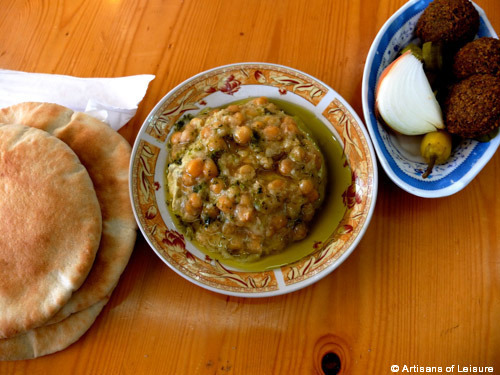 On a different end of the spectrum would be the first time I tried msabaha—warm cumin-scented hummus topped with whole chickpeas and drenched in olive oil—from Ikermawi, outside the Damascus Gate in Jerusalem. It’s tough to eat hummus any other way after you’ve had that. This past year, I was visiting my older brother in Melbourne, Australia, and we ate at a place called Charcoal Lane. It’s a restaurant and social enterprise that trains disadvantaged Aboriginal youth in the kitchen, using lots of indigenous Australian ingredients. The food was fantastic, and I ate so many things I hadn’t heard of before. Plus, they let me take home a lot of wattleseed. 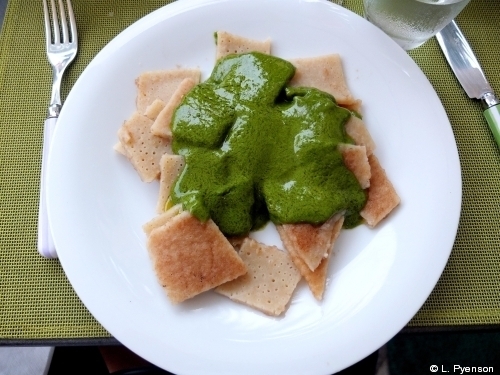 In Marrakech, I stayed at a lovely ryad with a private cook for the guests. You could wake up each morning and let her know what you wanted for dinner. I had seen motorcycles weaving through the medina stacked high with cardoons—a type of vegetable like a cross between an artichoke and celery—so I asked for a lamb tagine with cardoons, a combo I knew existed but hadn’t sampled yet. She was thrilled to make it for me, and I was just as thrilled to eat it. Q: Tell us about your undergraduate thesis. My undergraduate major was called International Literary and Visual Studies, which meant taking two foreign languages (for me, French and Arabic) and concentrating on film, literature or visual studies that related back to the cultures of the foreign languages. My thesis was basically an exploration of everything I had learned in the major, presented in the form of a 12-course dinner that I served to my examiners and an accompanying booklet, which was half cookbook and half a more traditional thesis. I examined the relationships among and histories of French, North African and Levantine cooking, and I presented each dish with many visual reference points to various themes, both concrete and abstract. 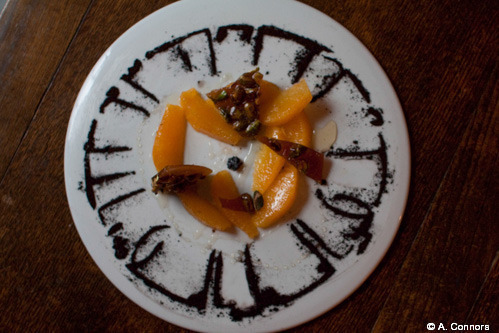 One dish was a reference to the Mosque-Cathedral of Cordoba. It was made from alternating red-and-white stripes of salmorejo and ajoblanco, two thick Andalusian soups, in arch-like patterns. Below the arches were four vegetable preparations meant to showcase produce first successfully cultivated by Arabs, then brought to Spain, and finally to Europe via Sephardic Jews—beets with orange flower water, fried and raw cauliflower with smoked paprika, charred eggplant with pomegranate molasses, and fried leeks. Jerusalem by Yotam Ottolenghi and Sami Tamimi. Everything I’ve made from it is outstanding. The book is actually too good because when I go to the Ottolenghi delis in London, it’s like…this is what I cook at home. I also love Nose to Tail Eating by Fergus Henderson, chef/owner of St. John in London, which might be my favorite restaurant in the world. The recipes—while not the type of thing I often make at home—are extremely entertaining to read. Rather than to chop parsley, for example, he’ll instruct you to “discipline” it. Q: Favorite culinary or tourism books? For food writing, anything by M.F.K. Fisher, especially The Gastronomical Me. I also just finished Frank Bruni’s incredible memoir, Born Round, which is so beautifully written. On the more scholarly side of things, I love Annals of the Caliph’s Kitchens by Nawal Nasrallah, which gives a detailed look at medieval Arab cooking and also includes a translation of a 10th-century cookbook from Baghdad. I love to read medieval Arab travelogues, like those of Ibn Battuta and Ibn Fadlan, who seemed to pop up quite a bit for me both in undergraduate and grad school. My all-time favorite travel book is a satirical work from the 18th century called A Journey Around My Room by Xavier de Maistre, a Frenchman who was under house arrest and decided to write a travelogue about his bedroom. Q: What took you to London to study? My Master’s program in the Anthropology of Travel, Tourism and Pilgrimage is unique, so I went specifically to do that course at the School of Oriental and African Studies. I was really interested to study at SOAS because the faculty is full of world-renowned specialists, and the student body is over 50 percent international. Q: Any insider favorite places, neighborhoods and experiences in London? The neighborhood where I lived, Brixton, is home to two adjacent covered markets full of great little shops and restaurants. It’s become a very popular place for Londoners, but most tourists don’t make it. It is individualistic to the point of (truly) having its own currency. David Bowie is on the £10 note, because he was born in the area. 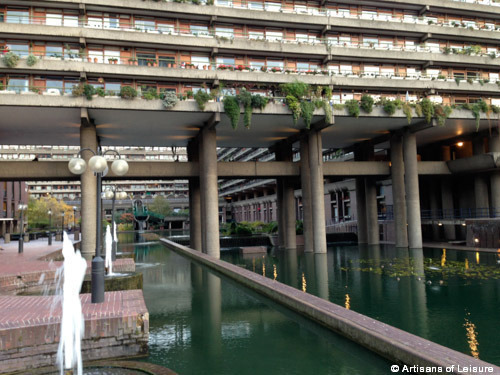 My favorite quirky place in London is the Barbican area, which is an architecturally bizarre housing complex/arts center in central-east London. The central courtyard-type space has a pool, fountains, palm trees and other lush plants. It feels distinctly different from the rest of the city. The arts center always has great concerts and exhibitions. It also has a great, gin-focused bar called Gin Joint. I love to walk along the Thames between Chiswick and Hammersmith and go to a pub called The Dove, which has been owned by the local brewery Fuller’s since the late 1700s. In the winter, it’s a cozy place for a beer and some stodgy pub food, and in the summer, it’s lovely to sit out on their deck, which looks out onto the river. 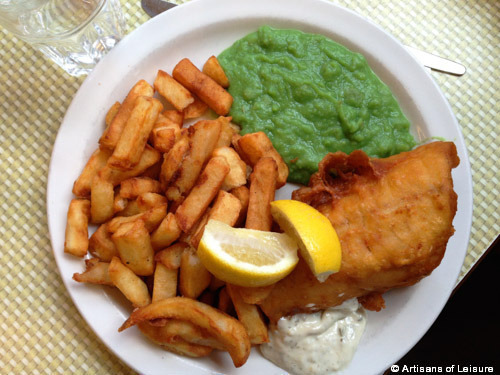 The best place for fish and chips is Regency Cafe in Pimlico, not far from Victoria, but they only serve it on Fridays. The place is a classic British “caff”—like a diner—that’s been around since the 1940s. The rest of the week, it’s the place to go for an English breakfast and a strong cup of tea. I can’t pretend that no other tourists know about this place, but the clientele includes plenty of local civil servants, construction workers and businessmen. Turkey, Japan and India are all up there, but every day working here I find a new destination I want to go next. I never thought I was terribly interested in Santiago, Chile, for example, but then I started doing research for a client’s trip there. Q: Why did you want to work at Artisans of Leisure? I knew it would be a great opportunity to put my travel experience to use in a new way, and be intellectually engaged with my work every day, whether it’s drawing on my knowledge of places I’ve been before or learning about destinations or cultures that I know less about. I love to help plan unforgettable experiences for friends when they travel abroad, and this is the same, just on a larger scale. It is also directly related to my Master’s degree. And I couldn’t ignore the amazing coincidence that Ashley [Founder & CEO of Artisans of Leisure] studied in a very similar Ph.D. program at a sister school of mine in London. Most people have no idea what I mean when I say I studied tourism anthropology. When I learned about Ashley’s background, it just clicked. That, coupled with reading the bios of my now-colleagues and the in-depth trip descriptions on the website, showed me that this is a unique company, one I could see myself at. Q: What are some of the projects and destinations you’re developing at Artisans of Leisure? 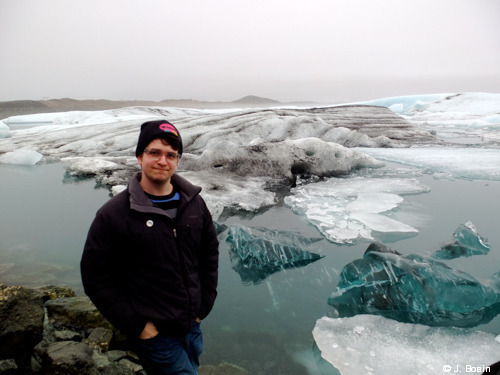 I recently developed tours in Iceland, which I’m very excited about. I’ve been to Iceland several times now, and it’s one of my absolute favorite destinations for design, architecture, food, and, above all, stunning nature. I’m also helping to develop some new tours that include northern Morocco, in particular Tangier and Chefchaouen, as well as France tours that include the French Alps. I also really enjoy working on the company’s restaurant lists—our clients receive a list of our favorite, most recommended restaurants in each destination and I love keeping those current. Q: Do you like to buy anything or collect anything when you travel? I collect lots and lots of ephemera—ticket stubs, business cards, rocks/stones, restaurant receipts from notable meals, etc. It’s more or less under control for the moment but might become more problematic as I get older. I usually like to bring back food products like spices, local alcoholic beverages and/or cheese, or cooking equipment. Q: What are some of your favorite museums? 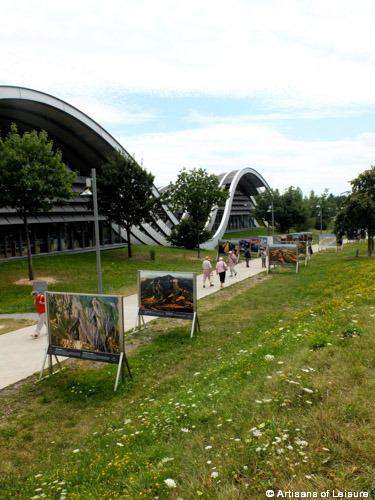 I love the Zentrum Paul Klee in Bern, which was designed by the architect Renzo Piano. It looks like a futuristic hobbit hole colony. The building itself is amazing, but I’m also a big fan of Paul Klee. London is full of incredible museums, so it’s tough to single out one. The Victoria & Albert Museum has a very diverse collection—you could spend days there. Each year they have an exhibition centered on the Jameel Prize, which they give out to an exceptional contemporary Middle Eastern artist. I loved everything in this past year’s show. The Tate Britain is great too, especially for their “Walk Through British Art” exhibit. The Reina Sofia Museum in Madrid always has great exhibits in addition to their already amazing permanent collection. They’re doing a show of one of my favorite Italian artists, Luciano Fabro, through April 2015. 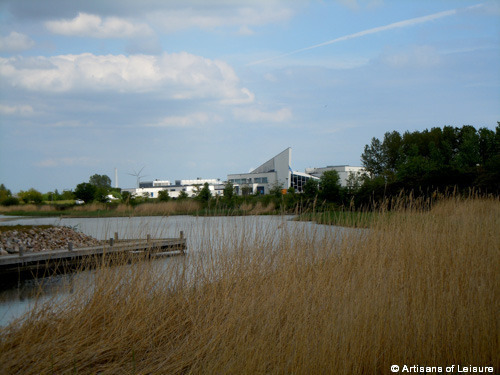 Arken in Copenhagen usually plays second fiddle to the Louisiana Museum of Modern Art, but it’s one of my favorites. They show contemporary pieces by artists like Olafur Eliasson and Ai Weiwei in an angular, abstract ship-like building next to the beach. Absolutely worth a visit. Q: Favorite historic attractions around the world? The American Legation in Tangier, one of my favorite under-the-radar attractions, is full of really interesting history. 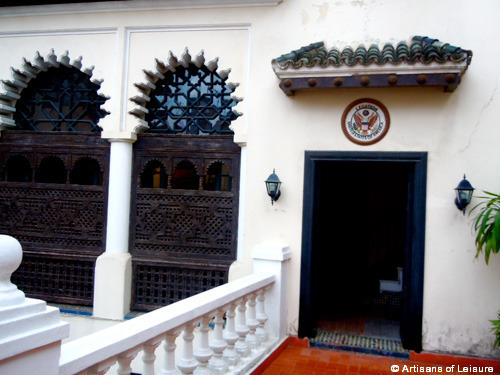 Morocco became the first country to recognize the newly independent United States in 1777, and this building was the first diplomatic post the American government acquired overseas. It’s now a U.S. National Historic Landmark, and one of the only ones on foreign soil. Imagine a cross between a Moroccan ryad and a colonial New England house—architecturally I’ve never seen anything like it. As a Bostonian who was studying in Morocco at the time, I found it pretty surreal. 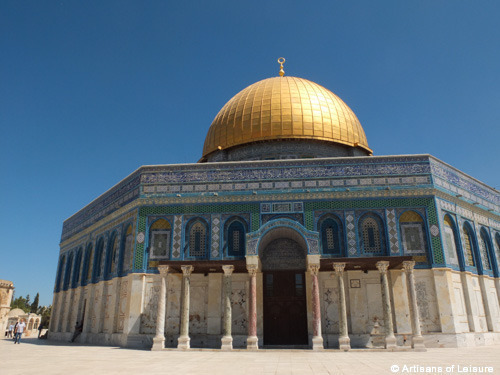 The Dome of the Rock in Jerusalem is incredible. I’ve never felt so much awe toward a building. 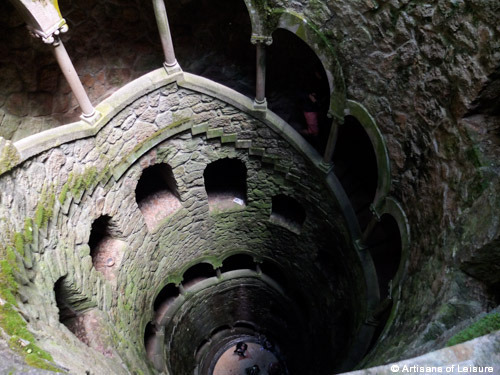 The Quinta da Regaleira—an early 20th-century estate and UNESCO World Heritage Site in Sintra, Portugal—blew me away. Exploring the sprawling grounds was like inhabiting a magical realism film. The Roman Forum is a favorite, too. Plus there’s a good place for fried artichokes nearby.